All towns, big or small, rely on the amenities and services on offer in the town, for their daily needs – and Braintree is obviously no different. But what about those extra special days? Weddings, parties, anniversaries or charity fundraisers, festivals, fairs and corporate functions? On such days, we often need a dedicated, professional catering service in order to cope with the demands of our guests and visitors. Here at Hog Roast Braintree, we do exactly that, and we think we offer a particularly unique and consummate service. As you might have guessed, our service is based around hog roasts, an increasingly popular and much-loved way of cooking and eating. We have trialled and tested our techniques and equipment to come up with the definitive hog roast. We have custom-designed machines which make cooking any sort of roast, as well as barbecue and side dishes, an intuitive, sanitary and effortless experience. And, of course, one which delivers consistently delicious results. Spit-roasting is a traditional, timeless way of cooking; a slow process which cannot be rushed, but it is the best way to cook meat, and we can bring the roast ready cooked to your event if it is not possible for us to be there early to cook on-site. It is this sort of flexibility that means our spit-roasts suit all sorts of events. But there is much more to us than that. We offer a fully comprehensive catering service, a service that can be made absolutely bespoke for your event. The reason for this is that, beyond a fairly rigid core of our service, i.e. spit-roasted meats, we are almost infinitely flexible. Our talented chefs and dedicated office team can work with you to devise your own custom, one-off menu. We can do this because of our dedication, and our organised supply chain. This is perfect for people who have a specific vision in mind, for instance, those with a wedding “theme”, or if you would like to incorporate a family favourite into a menu to give a party that intimate touch. Of course, we have preset menus, that you can opt for if you are not concerned with adjusting our existing options. And indeed, if one wants a simple hog roast, then the menu writes itself! An option of white or brown bread for your rolls might be all the choosing you need to do. And you might wonder if choice is overrated when you taste how delicious a simple pork roll is. What’s more is that we offer in person planning meetings, where we can get together to discuss at length what you wish for your event. We then draw up a timetable of the day in question for you, so you do not need to worry about wondering what is happening when. It’s our job to take care of everything, and this includes worrying! It’s your job to have fun, and we make sure all our customers have a hassle free day. With hog roast hire Braintree, everything is taken care of. Another important aspect of our service is our hog roast hire Braintree, a hire service which allows you to use one of our excellent spit-roasting machines. This is perfect for hosting your very own hog roast event, be it at a private party, or a night at a pub or members’ club – the possibilities are many and varied. It is all about putting the power into your hands. We can instruct you on how to get the best out of the machines, but fortunately, the machines are very intuitive. Everyone can be taught very quickly how best to use them, and our custom-designed tools make it easy to carve and serve. You can hire a machine out for as much a month, and this can be a handy “trial” period for deciding whether you want to buy a machine outright – and should you do so, the fee for the month’s hire is waived. However, if you just want to hire, this is of course fine. Rent on a daily basis, and see how a hog roast Braintree can transform an event into something special. 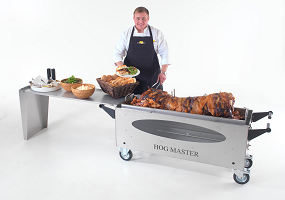 Hog Roast Hire Braintree is an excellent idea for the modern host. If you get in touch now, our helpful office staff can start to plan with you your perfect event. All our staff take great care and pride in delivering excellent service at each and every event we cater for, from the planning stages to the day itself, we never forget what’s important: giving you the occasion you’ve dreamed of.